The World's best beer contender? Today we have a real treat - the latest in the Stone Enjoy By series. Lovers of craft beer will know what this beer is; for those who don't - This series has always been labelled with an "Enjoy By" date in this case: 02.14.15 or in easier to understand language Valentines Day (Feb 14 this year). Stone Brewing put a 5 week date from bottling on each of these Imperial IPA batches. In typical Stone fashion this is a little different, instead of a tiny best before date under the bottle or on the cap, these guys include it in the name of this IPA. They say that they specifically brew this beer not to last, which is why I was particularly excited when I heard that an Experience IT had agreed a deal with Stone CEO, notorious stickler for freshness Greg Koch, to air freight this beer to Melbourne! Price wasn't an objection; I just had to have this beer! The pour is perfect for the style with a brilliantly clear golden body topped by a tight head of a slightly cream coloured white head. Possibly the head is a little small, but it does leave good lacing on the glass and has good retention. I'm starting to notice a trend among the Imperial IPA's that I've been drinking that the clearer they are the more I seem to like them... No idea why that is, but it certainly bodes well for Stone's Enjoy By! As expected the nose was dominated by hops, with citrus being far and away the most dominant of those hop characteristics. The citrus element was spearheaded by a very strong grapefruit aroma and was backed up by a more bitter citrus aroma, which I can't quite decide what I think it is... Maybe lime? As the beer warmed up a bit a resinous pine became more apparent on the nose, as did a caramel malt backbone. Right from the first sip I was in love with this beer! It had a much stronger than anticipated malt backbone, that managed to just about balance the cavalcade of hops - quite a feat! The pine flavour is much more noticeable to the taste and the grapefruit is fresh and juicy. Accompanying these flavour are some mango and apricot, which really just add to the overall juiciness of the beer. You'd have no idea this beer was 9.4% either, a particularly dangerous combination. Often the beers in this section are so over hyped that I am left feeling slightly disappointed after drinking them, despite them being truly excellent beers. 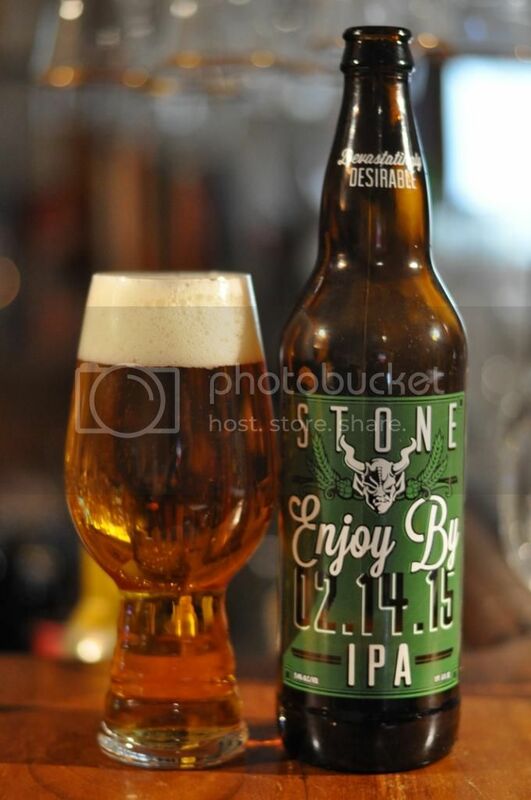 Not so with Stone's Enjoy By 02.14.15 thankfully! It's a brilliant American Imperial IPA, just so hoppy and juicy yet somehow still balanced. In other fantastic news it was announced that the deal to bring this beer out also includes a further shipment of Stone beers, in both bottles and kegs, to follow in March! I can't wait to get my hands on more fresh Stone!